Paula says - "Hold this little buffalo so the light catches it just right and its topline glows like magic!" Buffalo represents prophesy and fulfillment of powers. Buffalo also represents the perseverence and ability to rise above one's weaknesses. Buffalo teaches that everything exists in abundance if it is respected and accepted with gratitude. 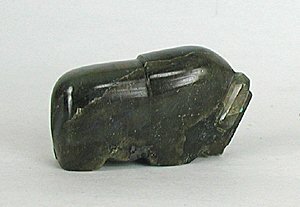 LABRADORITE is a variety of feldspar that in dim light shows grey or dark green colors and in bright light appears sea blue, gold and green. It is believed that Labradorite gemstone brings joy and kindness and provide variety and good fortune. It energizes and provide a balanced mental plane and also heals infections. It is said to raise level of consciousness and act as a barrier against all negative energies.